I was recently in Ibiza to attend Ibiza Sabor, an annual festival that celebrates the great produce and cooking of Ibiza and the Balearic Islands. I wrote in detail about this HERE. The Ibiza Tourism Board handpicked a number of exquisite restaurants for a group of international food writers and bloggers to visit during our stay. I extended my trip for a couple more days to visit two other restaurants, and I am so glad I did as they turned out to be two of the best meals I had on the island. We visited over a dozen different restaurants but I am recommending the top 5 of these. There are thousands of restaurants on Ibiza, quality varies tremendously but prices are generally high no matter where you go. So if you are shelling out big bucks you may as well know where to go and make sure to get some excellent food for your hard-earned cash. Unsurprisingly, fish and seafood play a major role in Balearic gastronomy, as do pork and various types of game including mutton and sheep. Due to the lack of cattle, beef is not widely available in the archipelago. In Ibiza, excellent quality extra-virgin olive oil, dried almonds and honey are produced, as well as liquors such as the popular ‘Hierbas Ibicencas’, sheep and goat cheeses, and their much loved ‘sobrassada’ a lightly spicy, cured and soft pork sausage (akin to an Italian Nduja), that is very much at the heart of Balearic cooking. Balearic dishes are hearty and generous, for example ‘Bullit de Peix’ is a magnificent local fish stew made with different types of fish and seafood, tomatoes, onions and potatoes cooked in a flavoursome stock with an accompanying garlic and saffron aioli. The beauty of bullit de peix is that the leftover, concentrated stock is also used to cook rice and make a 2nd dish called ‘Arroz a Banda’, which is served after the stew. I enjoyed both dishes immensely, and found a good recipe for them here - http://www.ibizafoodie.com/en/home-2/recipe-the-bullit-de-peix-at-cana-sofia/. Café Caleta is ubiquitous in Ibiza – traditionally made from burnt wheat as coffee was a scarce and highly prized commodity, today it is prepared with coffee beans, spices including cinnamon and cloves, lemon, sugar and plenty of brandy. It is a warming and strong coffee that you are likely to experience at the end of many meals on the island. Greixonera (a type of bread and butter pudding made with 'ensaimada' breakfast bread) and Flaó (an open goat cheese, hierba buena and aniseed tart) are two of the most traditional and popular of Ibizan desserts. Ibizan wines are also noteworthy, and the island has a number of vineyards. Local Ibizan varieties are Monastrell and Garnacha grapes for red wines, while the most important variety for white wine is Malvasia. Ibizan wines are made and produced in the areas of San Mateu, Buscastell, and Sant Josep. They produce wines that are medium to full-bodied, complex and well-structured. When visiting Ibiza, try to order these local wines – they are of excellent quality and comparable to other fine Spanish wines. Chef David Reartes’ latest restaurant Re.Art, opened in June 2017, is a real must for visitors wanting to experience top quality Ibizan ingredients tapas-style. 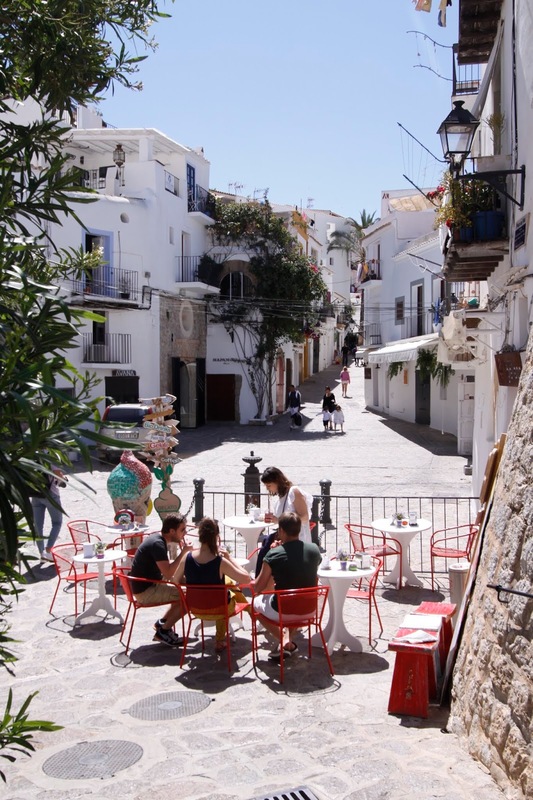 The restaurant is located right in the centre of Ibiza town so it is very easy to find. Re.Art has a modern feel with a long open-plan kitchen, and is a spacious restaurant with a number of tables outside. On the evening I was there (dining alone), the place was packed with a local crowd. David Reartes has his own vegetable and animal farms so most of the produce used in the restaurant is grown or raised by him, and in fact 80% of ingredients used in the restaurant are from Ibiza. Jason ibérico croquettes were super creamy and flavoursome, they were the best croquettes I had on this trip. Ibizan sausage and the lovely Sobrassada were served with Galitas – made simply from flour and water, these were small crispy homemade breads – a simple but great way to savour the Sobrassada. Equally good were slices of semi-raw bonito fish served tataki-style with a soy, mirin and vinegar sauce, lemon, rocoto chilli pepper and mango cream, with a sprinkle of micro coriander. Grilled aubergine was served with garum - an ancient Roman sauce made from fermented fish - was here made into an incredibly flavoursome emulsion with eggs and mustard, and served with toasts topped with Atsina cress (lightly sweet and aniseed similar to chervil), mirin, vinegar and soy sauce. This dish was exceptional. 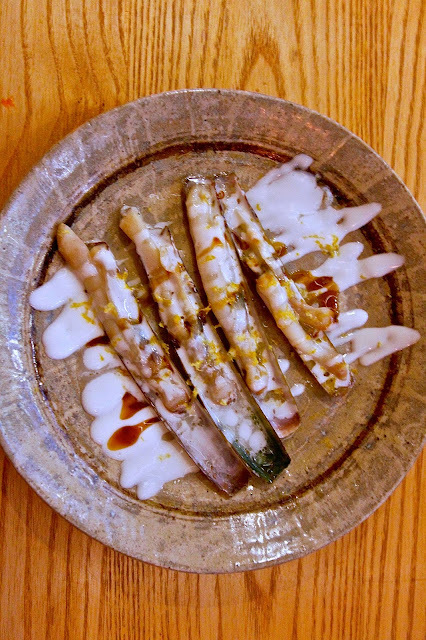 Also excellent were the razor clams in a white bay leaf cream, soy sauce, mirin and lemon, with a dusting of lemon zest. Grilled octopus tentacle came with a super-fine cream of potatoes, coconut cream foam, red pepper sauce and was nothing short of exquisite. Raw garlic-infused prawns were creamy and sweet, served with an emulsion created from the goodness of the prawn heads, croutons, micro coriander. Deep fried sous-vide egg in a light crust served over a cream of potatoes and sobrassada oil, topped with matchstick potato fries was another exceptional dish and despite the number of dishes that preceded it, that sous-vide egg tasted just as exciting as the first course of the meal. I ate the lot and scraped my bowl! For dessert I had cubes of pumpkin over homemade cheesecake. David explained that the pumpkin was crystallised through a process called “nixtamalization” which has been practiced by the Mexicans for over 400 years to make this particular dessert. The cubes of pumpkin are soaked in an alkaline solution of water and white wash (quicklime) overnight, before being thoroughly washed and cooked in sugar syrup. I love this dessert and make something very similar at home using Japanese kabocha pumpkin. 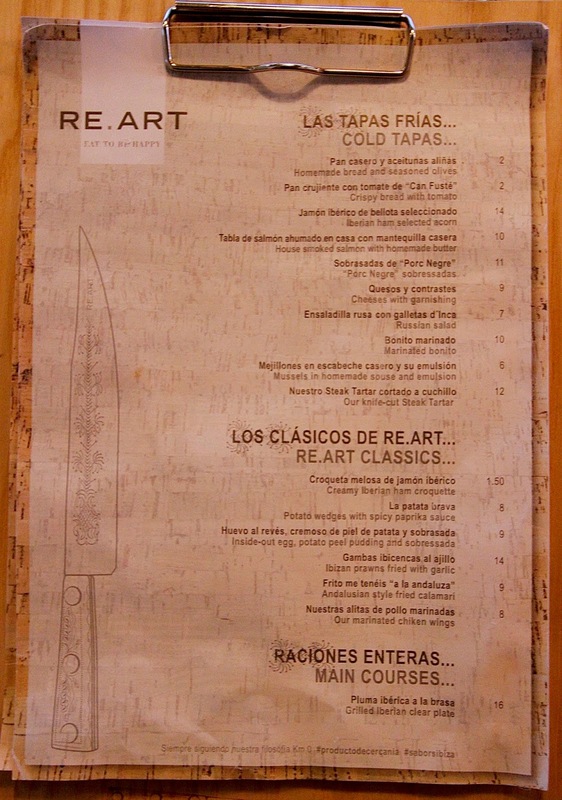 Re.Art is my top restaurant recommendation in Ibiza for many reasons – their use of unusual local ingredients kept me on my toes at every course. The dishes were exquisitely presented and delicious, the cooking was highly accomplished. Best of all, prices were not stratospherically high as most other restaurants in Ibiza. 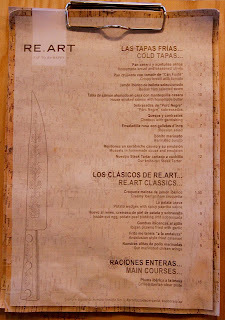 With its central Ibiza town location, Re.Art is a great spot for dinner and I highly recommend it. Can Domo is an Ibizan property from the 17th century which houses a rural hotel and restaurant. It has a sizeable organic farm and its own olive oil production. Owned by Belgian designer Alexandra Vermeiren and her Chef husband Pau Barba, Can Domo is an idyllic spot located on the top of a hill surrounded by nature, ancient pine and olive trees. The restaurant is beautiful and rather elegant, overlooking the hotel pool and the surrounding countryside. We had a fantastic dinner here – Pau Barba’s cooking is sophisticated yet wholesome, the food was well flavoured and used the excellent produce from the property’s own organic farm. 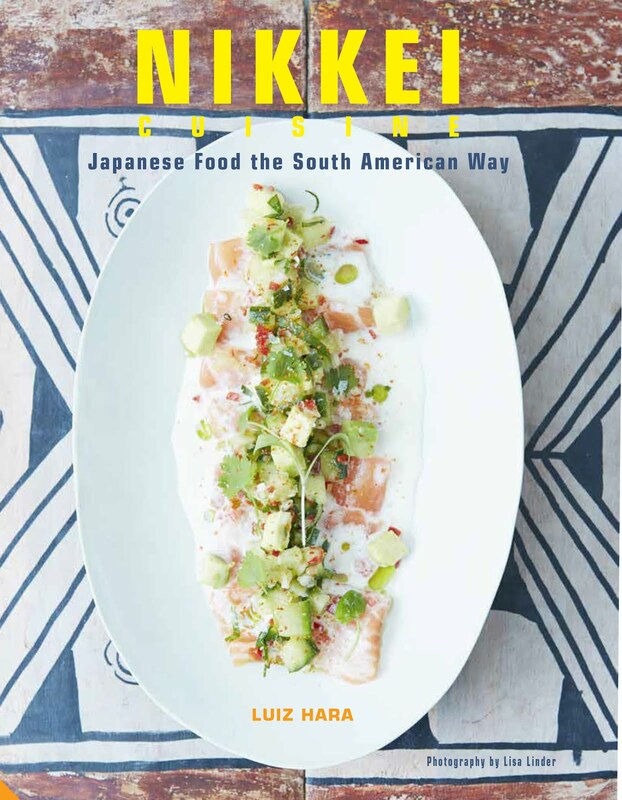 There were so many highlights – the raw fish, lime and herb ceviche was fresh, light and very flavoursome. Equally good was the sea cucumber, fish and egg stew – so unusual to see sea cucumber outside of Asian cooking, but it was exquisitely done. We had a well-made stir-fry of squid and pork, aubergines, peppers, onions and artichokes. The lightly grilled langoustines were also excellent. Pau’s seafood risotto was hearty and warming, accompanied by tender pulled lamb with a herb crust and pumpkin cream. I cannot recommend Can Domo highly enough; together with Re.Art, they are my top restaurant recommendations in Ibiza. I had a fabulous dinner at Sa Brisa in Ibiza Old Town - a 14-dish/11-course tasting menu (the Gourmet Menu, priced at €65 per person) with accompanying Ibizan wines presenting some of the best produce of the Balearic Islands. Sa Brisa is owned by the charming Esther Boned, a Catalan hotelier who fell in love with the island, and decided to move to Ibiza to open Sa Brisa in December 2013. The kitchen is headed by Chef Gonzalo Araguez – an Argentinian who worked in Mexico for many years, and now brings South and Central American touches to his Ibizan cooking - it is fresh, modern and very creative. There were many highlights including Yucca Churros filled with sobrassada – I also loved the vessel they were served in, a newspaper cone in a sobrassada hand! The Mohican Head with 4 canapés (courgette with almond, rabbit croquette, bulit de peix and lemon pith topped with an escabeche of mussel) was also creatively presented and tasted delicious. The sweet confit of tomatoes served over mashed potatoes and topped with dry fish crumbs from Formentera and samphire was sweet, sour and salty all at once. Ceviche with Araña white fish of Ibiza came with a Leche de Tigre made from mussel water and lime (salty and tart, perfect), dotted with pieces of cantaloupe melon. The grilled rabbit in a brunoise of potatoes, spiked in a Peruvian anticucho sauce was also outstanding, as was the Tortilla of Lamb in a mole made with Ibizan carob seeds (very similar to chocolate). Best of all was the roasted suckling pig - incredibly tender with a crisp skin, while the Mango pre-dessert (all made of mango prepared in many different ways) was also a highlight. For dessert proper, chocolate and apple tart served with crunchy fresh apple was a symphony of different flavours and textures, and a great end to the meal. Sa Brisa is in Ibiza Old Town, and is a gorgeous, elegant restaurant offering a number of tasting menus as well as a la carte. Ask for Esther (the owner) to help you with your choices - she knows every one of the dishes and has an encyclopedic knowledge of Ibizan ingredients and cooking. I highly recommend Sa Brisa in Ibiza. S’Espartar is a traditional, family-run restaurant and is one of the gastronomic landmarks of the island. It is heavily frequented by locals and visitors, and is another must visit in Ibiza. S’Espartar is famous for its big fish dishes – Bullit de Peix, Guisat de Peix and Peix en Salmorra (peix meaning fish), three of the most popular Ibizan dishes (I urge you to try them all!). The kitchen is headed by José Ferrer. The restaurant is rustic but comfortable with gorgeous views of the mountains and the nature that surround it. I tried the signature Peix en Salmorra - a huge platter with three different types of fish (grouper, rotja and dentex), potatoes, garlic, and peppers cooked in a fragrant sauce of fried onion, tomato, olive oil and fish broth. Peix en Salmorra is a wonderful fish dish and as with Bullit de Peix, the leftover broth was then used to make the rice dish that followed “Arroz a Banda”. It was also at S’Espartar that I had the best Flao Cheesecake of my trip to the island. We tried Flao on many occasions as it is one of the popular local desserts. The Flao was made with lemon, aniseed liquour, goat cheese and herba buena (a local spearmint) – it was sweet, aromatic, cheesy and divine. 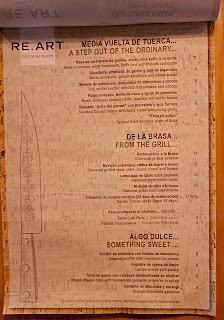 I loved S’Espartar for a number of reasons – big flavours, generous portions, a warm welcome and service. 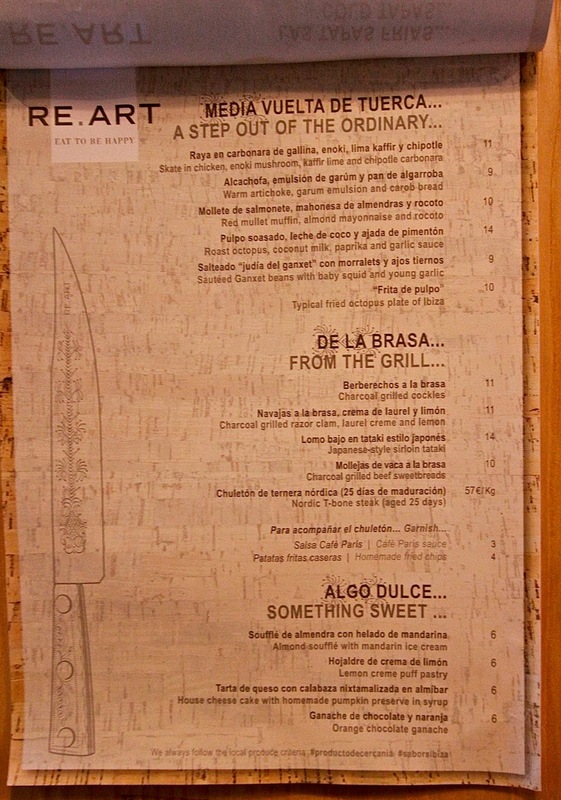 S’Espartar is completely different from my first three recommendations (Re.Art, Can Domo and Sa Brisa), but for a family-run, rustic restaurant serving big, honest dishes, it is the very best of its kind. Sa Caleta is another family-run restaurant serving traditional Ibizan dishes. I had a lovely meal here and got to try and number of the island’s local dishes. But what makes the restaurant such a must is its location on Sa Caleta beach (also known as Es Bol Nou Beach) – don’t get me wrong, the food was excellent, but the surrounding beach and setting provide some of the most beautiful scenery of the island. Sa Caleta beach is set against striking red cliffs that create a dramatic cove against the clear Balearic waters, especially when viewed from the top of the hill. The sandy beach has shallow, clear water, making it ideal for families and younger children, and it is also a great spot for snorkelling. This picturesque cove, lined with rustic fishermen's sheds, is also home to the ruins of the first Phoenician settlement on Ibiza dating back to 654 BC. Declared a World Heritage Site in 1999, it is free to explore with plenty of historical information available. At Sa Caleta restaurant (the only restaurant on that stretch of beach), I had my first taste of Guisat de Peix, an incredibly popular local dish the restaurant specializes in. Guisat de Peix is a fish stew with an assortment of different types of fish and potatoes cooked with a blend of chopped almonds and spicy red peppers. Guisat de Peix is not to be confused with another traditional Ibizan fish dish, Bullit de Peix (which is dryer, served with a garlic and saffron aioli, and its broth is used to cook the rice dish Arroz a Banda) while Guisat de Peix is served with the broth (making it more like a soupy fish stew) meaning that Arroz a Banda is not served as a second course. Guisat de Peix was originally eaten by fishermen who prepared it on their boats while out at sea – it is a rustic, rough and ready kind of dish with plenty of fish and big flavours. Noteworthy also were two of the local desserts we tried - Macarons de San Joan – a pudding of milk flavoured with cinnamon and orange with cooked pasta, and Greixonera, a local bread and butter pudding made with 'ensaimada' breakfast bread. Both were delicious and so different from anything I have tried before. The meal ended with the obligatory and rather potent Café Caleta – a strong concoction of coffee, spices including cinnamon and cloves, lemon, sugar and plenty of brandy. I recommend a leisurely lunch at Sa Caleta on the eponymous beach. But make sure to book at table outside and climb the top of the cliffs (after lunch) for some of the most stunning views of the island. I visited Ibiza at the invitation of the Ibizan Tourism Office to attend #IbizaSabor2018. 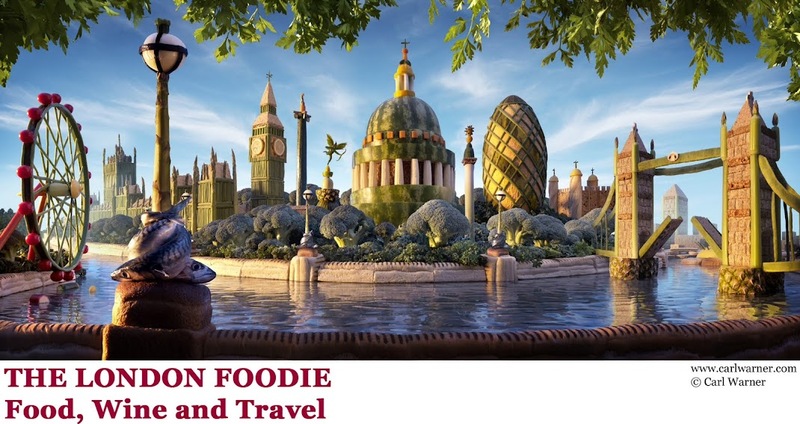 The London Foodie however maintains full editorial control over the content published on the site as always.